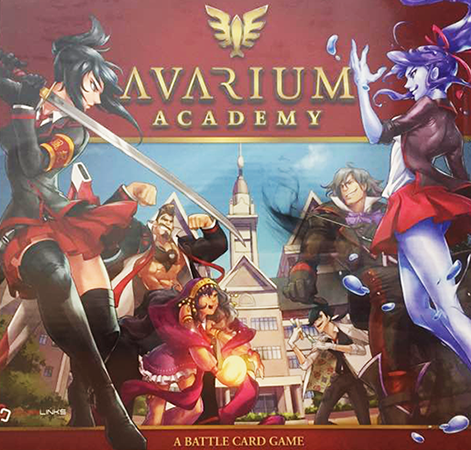 Avarium Academy is a game by Jared Cheah, published by Chain Links Games. It is for 2-4 players. In this game, players take on the role of one of the Idols (most popular students) in a magical Japanese high school. Players will be attempting to become Student Council President through any means necessary. Of course they’ll have to be careful not to get themselves expelled in the process. The player that can recruit the best students to their side to either fulfill their win condition or claim the most merit will be declared the winner. In this review, I will mainly be discussing the 2 player duel format. To begin, the board is placed in the middle of the play area. Players will each pick one of the Idol cards and place it face up in front of themselves in the area known as their “Class”. New players should start off with one of the Basic Idols for at least a game or two before moving to the Advanced Idols. Players will then take a Merit Dial and set the number on the dial equal to the amount of Merit shown on their Idol card. All the Student cards are shuffled together and placed face down on it’s respective place on the board to form the “School” deck. The discard space beside it is known as the “Expel Pile”. The top six cards from the School deck are flipped face up and placed in two rows of three in the middle of the board known as the “Courtyard”. The Scheme cards are shuffled together and placed face down on their respective place on the board to form the “Library” deck. The discard space beside it is known as the “Trash Pile”. Players then take turns drawing two cards from the top of the Library deck. This is the player’s starting hand. The attack tokens and Reputation tokens are placed on either side of the board within reach of all players. The first player is chosen. The second player receives 2 extra Reputation and play now begins. A player’s turn is broken down into 3 phases; a start phase, a planning phase and an end phase. The first phase is the start phase. This phase is broken down into 4 steps. First off the player checks their Idol card’s Win-Con or win condition. Next the player readies their Idol and Student cards. These first two steps are not done on any player’s first turn. On later turns, readying a card is done by simply turning it back upright. From there, the player gains reputation from their Idol. The amount is indicated inside the gold star on the Idol card and is gained through Reputation tokens. Finally a player draws the top card from the Library deck. Once this is done, the player moves into the next phase. The second phase of a player’s turn is the planning phase. In this phase a player is able to perform any of 3 different actions as many times and in any order they would like, until they choose to end their turn. The 3 actions are recruit a student from the courtyard, play a scheme and declare a fight. To recruit a student, the player spends Reputation equal to the Reputation cost of the student card. The student is then placed on top of the player’s Hallway space on the board in front of them. The player then replaces the removed student card by drawing a new card from the School deck. To play a scheme, the player reveals the card from their hand, reads the card’s effect aloud and then pays the cost either by spending Reputation equal to the scheme’s cost or by exhausting a Student in their class whose cost is equal or higher than the cost of the scheme. Once the cost is paid, the scheme’s effect takes place. The card is then placed into the Trash pile. Some schemes called “Surprises” can be played at any time, not just during the planning phase. Fighting is a little bit more detailed. Fighting is how players can expel another player, their Idol or a student from the school. Each Idol or student is only allowed to attack once per turn and only one at a time. Fighting follows 3 steps. First the player gets set. This is done by choosing a ready student or Idol with no attack tokens on it and declaring it as their attacking leader from their class. Next a target is chosen from one of the other player’s students or Idol. However an Idol is only allowed to become the target of an attack if the opponent player’s class has no more ready students to attack. The enemy becomes the defending leader. Second the player’s party up. To do this the player may assign any students or their Idol that is not already in the fight to help support the attacking leader. This forms the attacking party, that once chosen, can’t be changed. The defending leader’s player is then allowed to assign any of their students or Idol that’s not already in the fight to support the defending leader. This forms their defending party which can also not be changed once it’s chosen. Student abilities and schemes that are allowed, may be played at any time before this in the fight. The last step is to fight. Damage is assigned by calculating the combat power of all the cards in the player’s attacking party and dealing damage to the opponent’s defending party. The opponent then does the same thing with their defending party to the attacker’s attacking party. Damage is dealt first to the leader and then any remaining damage is divided up between the other students or Idol in the party as the player sees fit. If an Idol takes damage, the amount is removed from their Merits. If an Idol loses all their Merits, they are expelled. If a student takes damage equal or higher to it’s defense, it is expelled and placed into the Expel pile. If it’s not expelled, the student card is exhausted. This is shown by turning the card sideways. Once all this is done, clean up is done by removing any damage left on students still in the player’s class and then putting an attack token on each Idol or student that attacked. The third and final phase is the end phase. Once a player decides to end their turn, they must then say, “I end my turn”. They then finish their turn by doing a number of things. First they place all the student cards in their Hallway into their Class. If a player has more than 5 students in their Class, they must then expel a number of students until they have no more than 5 students in their class. The player then checks their hand. If they have more than 5 cards in their hand, they must trash a number of cards until they have no more than 5 cards in their hand. Finally they player removes all attack tokens from any of their cards that have them placed on top of them. The player finishes their turn by completing any end of turn effects. Play then passes to the next player. The game continues until one of 3 things happen. If a player achieves their Idol’s Win-Con, they win. If a player is able to expel all the other players by bringing their Merit down to zero they win. Finally if the School runs out of cards, the game ends and the player with the most Merit is the winner. This game has a lot of really great looking pieces. There’s a really nice board that folds up nicely to fit inside the box. The artwork isn’t elaborate on it or anything but it’s nice to have a place to set everything instead of just throwing it all down in the middle of the table. There are lots of really great looking cards. The artwork is really amazing and looks like something taken from some quality Manga or Anime. The Idol cards have gold embossing on them which is a really nice added touch. The reputation and attack tokens are a little bit thin but work fine. About the only thing that concerns me is the Merit dial. It’s a bit flimsy and feels like it could fall apart at any minute. I would have liked it better if they had been made of a little thicker materials, like the dials for King of Tokyo or Lord of the Rings the Card Game. For now though, this gets the job done. In any event, I really love the look and feel of the game and it has a great thematic feel to it. Overall I think the game is pretty well put together and gets a passing grade. The rulebook is really nice. There are lots of great pictures throughout the book including both examples as well as some great art samples from the cards themselves. Each of the different card types are explained in great detail with pictures included. The book isn’t difficult to read. I will say that it’s a bit of a flip fest when it comes to understanding however. The phases of a player’s turn are all laid out well but you will find yourself flipping ahead and then back to understand each concept and step. It’s a bit tedious but once you understand each step it’s not that big of a deal. I will say though that it works out pretty well as reference material since you can find each concept fairly quickly while playing. The book also has advanced rules for playing a 4 way multiplayer Battle Royale. Also included is a great reference guide that shows the breakdown of a player’s turn as well as a page of frequently asked questions for more clarification. Overall I’d say the book looks really great but suffers just a little bit on explaining the rules in a cohesive sequence of events. This is a really fun game that plays a lot like a CCG (Collectible Card Game). It has a lot of that same feel as games like Yu-gi-oh! or Force of Will. There’s that real great player interaction and elimination that you get from those CCGs except you don’t have to trace down all the rare and powerful cards. It can get a bit math heavy when multiple students and Idols are fighting, factor in a few schemes intertwined here and there and some exhausting of students for payment…you get the picture. The game works really great as a 2 player game. More players tend to muddy the waters too much and cause more wins through fulfilling an Idol’s Win-Con then through elimination. For me, I prefer a more well rounded game where wins can be accomplished through multiple paths instead of being due to fear of attacking. In any case, I really enjoy playing this one, especially in a 2 player duel capacity. Players of dueling card games like Yu-gi-oh! or Force of Will should really enjoy this one. Fans of manga style art should enjoy the great artwork and designs. Overall, the game has a lot going for it and is a lot of fun. 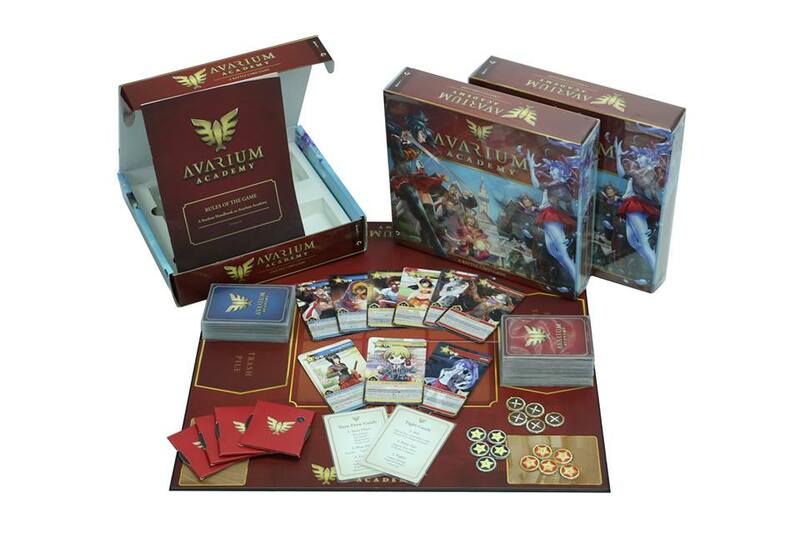 Avarium Academy is a medium weight card game that plays like a CCG. The game doesn’t take that long with most sessions lasting around 20-30 minutes. The artwork is outstanding and feels like it was ripped from some of the best quality Manga or Anime. I love the design of the cards and love the extra little foil touches on the Idol cards. The tokens are a bit thin and the Merit dial is a bit flimsy but they get the job done. The game can be played with more than 2 players, however the duel format is where the game really shines best. Fans of dueling card games like Yu-gi-oh! and Force of Will should really enjoy the CCG feel of this game. Players that enjoy a lot of player interaction should find this one right up their alley as well. I would highly recommend this as a 2 player game. I really hope to see some expansions for this game in the near future with more Idols, students and schemes. This is a really great game that, like sushi, I can’t get enough of. For more information about this game, please check out Chain Links Games at the Avarium Academy main site. This entry was posted in Reviews and tagged academy, avarium, avarium academy, board, board games, card, card games, chain, chain links games, cheah, games, jared, jared cheah, links. Bookmark the permalink.